>> You know what totally smokes? The forthcoming Futureheads single "I Wouldn't Be Like This If You Were Here." The high-octane slammer hearkens back to the Sunderland-situated quartet's amazing 2004 full-length debut. The single will be issued Dec. 8, but you can already hear a crappy-sounding stream of the track at the band's MySpace dojo here. The Futureheads embark on a three-week tour of the U.K. and Ireland with clicky clicky faves Johnny Foreigner at the end of the month. We weren't all that certain of the pairing, but now that we've streamed "I Wouldn't Be Like This If You Were Here" a few times and hear The Futureheads are back with their A game it is starting to make sense. Full tour dates are listed at the aforementioned MySpace page. The Futureheads released its third set This Is Not The World on its own Nul Recordings label in May; we reviewed the band's July 2006 Boston gig here. We just remembered something Johnny Foreigner and The Futureheads have in common: both acts have been remixed by Dolby Anol. Here's the remix of "Radio Heart." 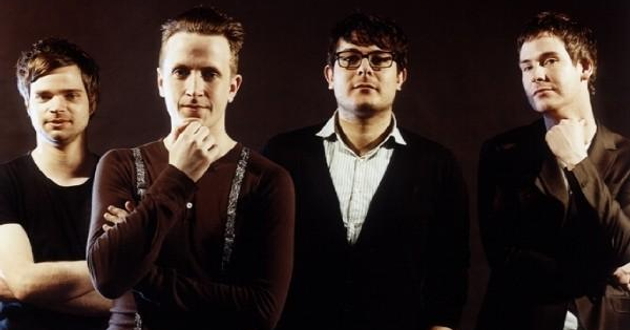 The Futureheads -- "Radio Heart (Dolby Anol Remix)"
>> London-based indie rock foursome Fields Tuesday cited label negotiations as the precipitating factor behind the cancellation of a planned strand of November tour dates. The cancellation isn't quite as interesting as the fact that Fields, which was apparently the subject of a bidding war in the U.K. in 2006 after playing only a small number of shows, is -- according to a MySpace blog from fronter Nick Peill -- "in talks with a new record label." The band's full-length debut Everything Last Winter was issued by Warners in the UK; in our opinion it did not live up to the promise of the mysterious, stellar preceding EP 7 From The Village. As we reported here in October, Fields had intended to issue its sophomore set Hollow Mountains in March 2009 (after previously hoping it could be out by the end of this year). However, the aforementioned label negotiations could push back the release of the long-anticipated set. Strangely, a second MySpace blog posted Tuesday made it sound as if a new label deal was already in place, and that it was the new label's decision to scotch the dates. "We have been trying to get the label to organise some shows for us for months now and the decision to pull this tour was not that of the band." Drama! >> News circulated Tuesday that Asobi Seksu's forthcoming third full-length us titled Hush. We had reported here in September that the New York-based dream pop duo would issue the new set in early 2009, and Asobi Seksu now says the release will be in March, which we expect is timed perfectly with the annual South By Southwest confab. As we had also reported previously, Hush will be preceded by the single "Me & Mary" b/w "Breathe Into Glass" Nov. 18. For you vinyl-ophiles, the band's supremely great sophomore set Citrus will finally be issued on vinyl Nov. 25 by Friendly Fire. More details and the Hush track listing can be found in this Pitchfork item. >> Pun Canoes here points to this recent post on The Lemonheads' blog, in which band leader Evan Dando explains the delay of the planned covers album Varshons, which was to have streeted in September. The set will apparently now be released in March, Mr. Dando says.